Boston Red Sox scout Ernie Johnson signed John Michael Paveskovich to a minor league contract in 1940. Red Sox fans that enjoyed “Mr. Red Sox” thought-out the years, can thank his mother for insisting that he sign with the Red Sox. “There were a number of teams interested in me when I was playing high school ball,” Johnny told me in an interview several years ago for a feature in Red Sox Magazine. “The St. Louis team wanted to sign me, and the Indians were following me. But Red Sox scout Ernie Johnson was very nice to my parents. He used to come over to our house with flowers for my mother and a bottle of bourbon for my father,” he chuckled in memory during our 2008 interview. John Michael Paveskovich was born in Portland, Oregon, on February 27, 1919. The fifth of six children, Johnny’s parents, Jakov and Marija, had emigrated from what is now Croatia as World War I began to heat up. Baseball has been a constant in Johnny’s life for as long as he could remember. In addition to playing sandlot ball at every opportunity, the youngster became a fixture at Vaughn Street Park, the home field of the Portland Beavers in the Pacific Coast League. “I started hanging around the Beavers’ clubhouse shining shoes when I was 10 years-old,” Johnny recalled. “When I started out, I worked in the visitor’s clubhouse, and that’s where I first got a look at Ted [Williams], Bobby [Doerr], and Dom [DiMaggio], when they came through playing for San Diego and San Francisco. I still can’t believe we’ve been friends for all these years,” he said, shaking his head in wonderment. “I eventually became the head clubhouse boy,” he continues. “It was a great job, because we made some money and we got to use the field when the Beavers went on the road. And just being around professional ballplayers I was able to learn a lot about the game,” he emphasized. Pesky has been Johnny’s “baseball name” from the beginning. “A lot friends and neighbors called us ‘Pesky’ because it was easier than our full name,” he remembers. But he officially became Pesky when he slapped a line drive over shortstop in a pickup game that included local sports writers. The sports editor of the Oregonian, L. H. Gregory asked, “Who was that pesky hitter?” and the name stuck. “Heck, even my driver’s license says ‘Pesky,’” Johnny chuckled. After signing with the Red Sox, Pesky began his professional baseball career 3,000 miles from home in Rocky Mount, North Carolina. He credited his first manager, Heinie Manush, with shaping him into a credible baseball player. “Heinie Manush had just finished a long career [17 years] in the big leagues, and he really knew how to play the game. I could hit okay and field, but he helped me to put it all together,” Johnny observed. Pesky led the Piedmont League in base hits playing for Rocky Mountain in 1940, and he was promoted to the Red Sox top farm team in Louisville, Kentucky, for the 1941 season. Installed as the Colonel’s everyday shortstop, he proceeded to take the American Association by storm, leading the league in hits and earning the MVP award. His outstanding play earned him an invitation to spring training with the Boston Red Sox in 1942. Johnny Pesky always loved to tell the story of his first real conversation with Ted Williams, which took place at the Red Sox training camp in Sarasota, Florida, in 1942. “I was having dinner with Bobby Doerr in the dining room of the Sarasota Terrace Hotel. Bobby and I had finished dinner and we were talking, and all of a sudden Ted appeared. He sat down and started talking to Bobby. I was kind of in awe. Here I was a rookie sitting with Ted Williams, who hit .406 the year before. During the rich history of the Boston Red Sox a number of players have enjoyed outstanding rookie seasons with the team. Ted Williams’ rookie season is the stuff of legends, and six other players have been selected as the American League Rookie of the Year. Certainly Johnny Pesky’s rookie season ranks near the top in club history. 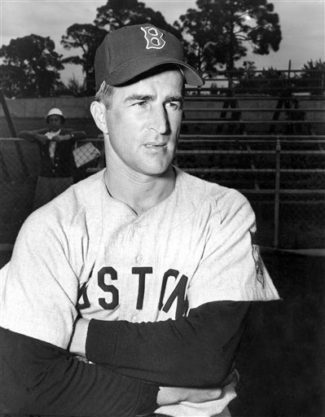 In his rookie year, Johnny Pesky led the American League with 205 base hits and finished second to Ted Williams in the race for the American League batting crown with a .331 average. He displayed great fielding range at shortstop, earning The Sporting News selection as the shortstop on their Major League All Star team. And he finished third in the voting for the Most Valuable Player in the American League. Sixty-six years later Johnny Pesky remained modest about his rookie accomplishments. “I was hitting behind Dominic [DiMaggio] and when he got on the pitchers were keeping an eye on him because he had terrific speed. And I was hitting ahead of Ted so the pitchers weren’t going to walk me and let Williams drive me in. I saw a lot of good pitches to hit,” he concludeds. Following his commission, he was assigned to Gordon Field in Atlanta. It was there that he met his true love, Ruth Hickey. “Ruthie was a WAVE at the Naval Air Station and she was from Lynn. She was a great girl and a wonderful mother,” Johnny said with sincere emotion about his late wife of over 60 years. “I was lucky she picked me. She could have done a lot better,” he added. Johnny Pesky and Ruth Hickey were married in Lynn, Massachusetts, on January 10, 1945. Three weeks later he was shipped off to Pearl Harbor, where he spent the balance of World War II. He was discharged from the U.S. Navy soon after the Instrument of Surrender with the Japanese was signed aboard the aircraft carrier Missouri in September 1945. Like most of his teammates in 1946, Pesky hadn’t faced major league pitching in three years, but it didn’t seem to slow him down one bit. In 1946 he played a major role in the Red Sox successful drive for their first American League pennant in 28 years, and he finished fourth in the voting for the Most Valuable Player in the American League. He was named to the American League All-Star team that season, and he appeared in the first midseason classic to be held at Fenway Park. In 1947 Johnny Pesky led the American League in hits for his third straight season. His .324 batting average was third best in the league, and his 106 runs scored placed him third as well. The Red Sox finished third that season, a disappointing 14 games behind the pennant-winning New York Yankees. But Johnny Pesky had established himself as one of the premier shortstops in Major League Baseball. 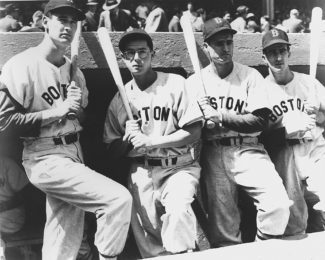 The 1948 season represented a year of change for the Boston Red Sox and for Johnny Pesky. In a major shift, Joe Cronin, who had managed the club for 13 seasons, moved from the dugout to the front office as general manager of the team. The legendary Joe McCarthy, who had previously managed the Chicago Cubs and most recently the New York Yankees, replaced him as the manager of the Red Sox. During his 16 seasons as manager of the Yankees, McCarthy’s team won eight American League pennants and seven World Championships. In yet another adjustment for Pesky, he had to contend with injuries for the first time in his career. After playing in almost every game for three seasons, in mid-May he pulled a thigh muscle but missed only a few games. “In those days, you put a little tape on it, and went out and played,” Johnny laughed. The tape got him back into the lineup, but he quickly came up with a charley horse. “I may have pushed it a bit,” he admited. By mid-June he was back in top shape and he hit a two-run home run off Hal White of the Tigers. Johnny remembers that home run as the longest he ever hit. “The wind must have been blowing out that day,” he demured. That home run raises the subject of “Pesky’s Pole” in right field at Fenway Park. “The fellows were teasing me in the dugout after I wrapped a 300-foot home run around the foul pole one day. And it would have stayed in the dugout if Mel Parnell hadn’t told everyone about it on TV,” he laughed good-naturedly. Johnny Pesky celebrated the Fourth of July by driving in four RBI in one inning in a game against the Philadelphia Athletics, and on July 25 the club moved into first place in the American League for the first time all season. For the balance of the season, the Red Sox, Yankees, and Cleveland Indians fought tooth and nail for first place in the American League. In the final weekend of the season the Red Sox swept the Yankees, earning a share of the American League pennant with the Cleveland Indians. Johnny Pesky has an unusual memory of the joy surrounding the Red Sox victory on Sunday and the disappointment of the playoff loss to Cleveland the following day. “I was going to a wedding after the final regular season game, and I brought my old Naval uniform to change into after the game. The guys were convinced the uniform was a good luck charm and insisted I wear it to the playoff game. Boy were they wrong,” he said, remembering the 8-3 loss to the Indians. 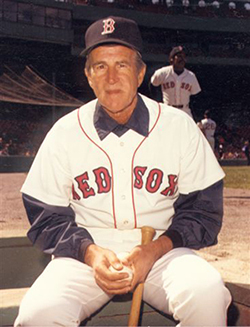 Johnny Pesky continued as the team’s regular third baseman in 1949 and 1950, but in 1951 Red Sox manager Steve O’Neill moved Stephens to third and returned Pesky to shortstop. During all three seasons Johnny batted over .300, and his on-base average ranked in the top ten among American Leaguers. Red Sox fans considered the likeable Pesky as a fixture at Fenway Park, but in June 1952 he was traded to the Detroit Tigers. Pesky played with the Tigers through June 1954, when he was dealt to the Washington Senators. He played his last major league game on September 24, 1954, appearing as a late inning defensive replacement at shortstop for the Senators. Ironically, his last game was played at Fenway Park, and Washington swept a doubleheader from the Red Sox. Johnny Pesky’s official title with the Boston Red Sox in his later years was Special Assignment Instructor. He has been with the ball club for a total of 57 seasons, the last 40 of them consecutively. Over the years he has been a player, a coach, and a manager for the team. From 1969 to 1974 he was a member of the radio/TV broadcasting team, and for many years he sold advertising in the team’s publications during the off-season. Johnny insisted that he had enjoyed every role he has played for the Red Sox with one slight reservation. “I was never really comfortable with the broadcasting job. I remember I used to listen to talk radio and some guy would say, ‘That Johnny Pesky stinks on the game broadcasts.’ And I would have to say I agreed with him,” he chuckled. “This organization has treated me so well,” he continued. “Mr. Yawkey was wonderful to me and all the players. I remember at the end of the 1942 season he gave me a $5,000 bonus and I only made $4,000 for the season. I used that bonus to pay off the mortgage on my family’s house, and my brother still lives there to this day. “And the current ownership has done a lot to make the former players feel wanted. I know we all appreciate it,” he said. “It has been wonderful to be associated with this club for all these years. “I really have been blessed all these years,” he added. “I had my wonderful wife Ruthie for 60 years, and our son David really looks after me. Ruthie really deserves all the credit for how well he turned out, because I was away so much, but he really is a wonderful son,” he said proudly. When Johnny Pesky broke in with the Boston Red Sox in 1942, the umpiring crew had three members, the fielders tossed their gloves behind their positions at the end of each half inning, and all of the games were day games. Pesky loves to talk about those days, and especially his longtime teammates, but his primary focus is on the present. Johnny went on to explain the changes that every young player has to make. “When you first come up and have some success, the other teams watch you carefully and make some adjustments. The good young hitters, and Ellsbury is one of them, adjust to the different way they start pitching to you. Jacoby is going to be an outstanding player for this team for a long time,” Pesky said prophetically. Another Pesky favorite was All-Star second baseman Dustin Pedroia. “Oh boy, I love the way that kid plays the game. Terry [Francona] asked me to work with Dustin in spring training in 2007, and I knew he would be a good player. But he has been even better than I expected,” Johnny admitted. “He plays hard every day,” Pesky added. For Boston Red Sox fans, the sight of Johnny Pesky raising the 2004 World Championship flag on Opening Day 2005, symbolized a dream come true. And what was Johnny Pesky thinking as he helped hoist the banner to the top of the flagpole that day? “I said a little prayer as I was I was raising it up. I do that a lot, because I have truly been blessed with a wonderful life. 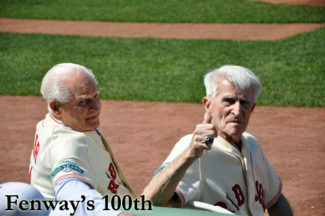 And, of course, I thought about Mr. Yawkey, and Ted [Williams] and all my teammates who couldn’t be there. It was a great thrill,” he added with strong emotion. On September 23, 2012, several thousand Red Sox fans joined with Red Sox players, the coaching staff and team management in a memorial tribute for Johnny Pesky at Fenway Park. Former Red Sox pitching star Pedro Martinez offered a particularly moving remembrance. It was my great pleasure to know and interact with Johnny Pesky for 25 years. The last time I spoke with him he said, “Thanks, Herb, for that great article you wrote on me for Red Sox Magazine. Now all my friends think I’m a big deal.” All I could manage in response was, “Thank you John for all your help for all these years.” I wish I had said more and I wish I had said it better. When I contacted Johnny to schedule our interview for his 2008 feature, the ever-humble Pesky said, “Oh gosh Herb, I think Red Sox fans have heard enough from me over the years.” Johnny Pesky: Boston Red Sox fans could never have heard enough from you. You will always be Mr. Boston Red Sox. This Feb. 26, 1952, file photo shows Boston Red Sox infielder Johnny Pesky during baseball spring training in Sarasota, Fla. Pesky, who spent most of his 60-plus years in pro baseball with the Red Sox and was beloved by the team’s fans, died on Monday, Aug. 13, 2012, in Danvers, Mass. He was 92. This article originally appeared in Red Sox Magazine, the official program of the Boston Red Sox. To subscribe to Red Sox Magazine click here. I loved reading your story on Johnny. I have read many stories and books about him over the many years I have followed the Red Sox and never get tired of reading those stories over and over. He has to rank with Ted and Yaz as the most popular Red Sox ever. There was never a more dedicated player than Johnny to ever wear the Red Sox uniform and there will never be another player who will match that dedication because of the huge contracts, agents, and free-agency that ruins the commitment and loyalty by todays players. He is a legend and I hope there is baseball in heaven because I expect Johnny will be there suited up with No 6 on his back. RIP John Michael Paveskovich. Hi Herb Finally got around to reading your article on Johnny Pesky. After a couple of sentences, I couldn’t read it fast enough. Very, very well done. Pesky was one of my favorites (after Bobby Doer). I particularly enjoyed the end when you told of your personal contacts with him. It showed what a kind and considerate person he was. Your web page gets better and better. D. O. D.
Search engines remain a mystery to me! I visit day-to-day a few sites and blogs to read articles, but this weblog offers feature based articles. I have been a Red Sox fan since 1946 . And Johnny Pesky has been my favorite player since then. I esp remember the Pesky to Doerr to York double plays. He was the best at everything he did, both as an active player and in retirement. That loss in the ‘46. World Series was a heartbreaker. Thank you for this fine tribute to a great guy.